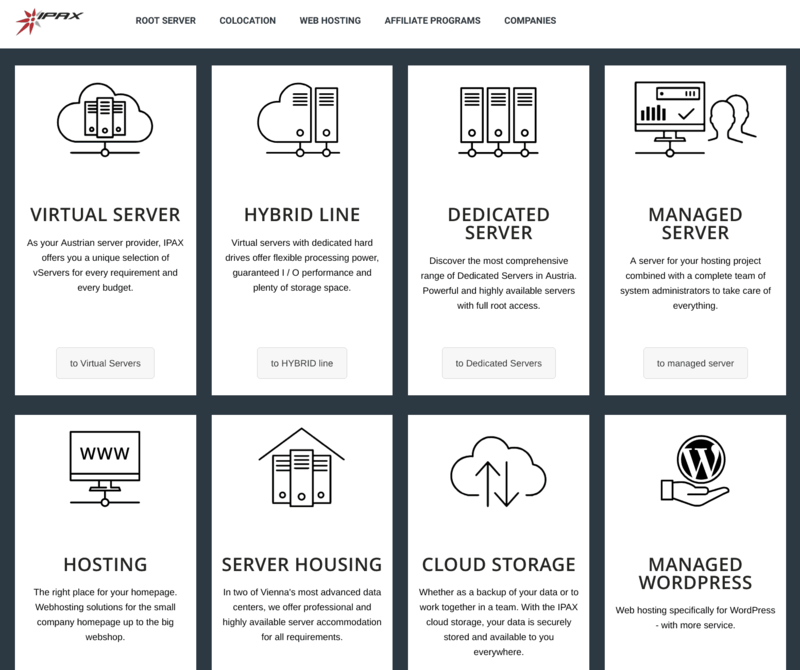 IPAX Review 2019: Is IPAX a Good Hosting? IPAX has great infrastructure but disappoints when it comes to hosting plans and customer support service. Established in 2006, Austrian web host IPAX has data centers in Vienna and offers services mainly to German- and Spanish-speaking customers. It is one of the very few hosting providers in the world that runs its data centers on 100% renewable energy. Like most hosting providers in Western Europe, IPAX offers high quality and reliable infrastructure and equipment. Thanks to its redundant power supply and high-quality hardware, you can expect 100% uptime at IPAX. Moreover, being located in Austria means your data is covered by the European data protection regulations, which that you know your data is safe when you use their cloud services. The domain registration process is quite simple, and you get to register a domain for free when you sign up with them for the first time. A staggering 400+ different domain extensions can be registered at IPAX. You also get unlimited addon domains in your hosting package, but this is not as appealing as it sounds when you consider that you only get a maximum of five databases which severely restricts your ability to host multiple websites. If you want multiple databases, you can move on to the Business Host packages which come at slightly higher prices but are definitely worth it with the included features. IPAX offers daily geographically-independent backups, retained for one month, but they do charge you for restoring your site from the latest backup. You can install an SSL certificate on your first website for free, but every additional website costs extra. Alternatively, you can opt for the multi-domain SSL certificate that covers several websites with a single SSL certificate license. The cheap packages at IPAX allow you to host unlimited websites, but – as already mentioned – you are limited by just five databases and a maximum of 20GB storage. The most basic package doesn’t offer any database at all, which means that single site owners using WordPress or other database-dependent applications will be massively disappointed unless you look at the specific WordPress hosting package. Alternatively, you can take a look at the Business Host packages. They offer unlimited features for a price that might be a bit high for casual bloggers, but could definitely be worth it for businesses looking for quantity as well as quality. You can contact this company by telephone or email during working hours only, and there is no live chat or social media presence. The only positive (if you see it as such) is that with your permission they can take over your computer to provide remote support. The only thing wrong about IPAX’s web hosting packages seems to be the lack of sufficient databases in their Webhost Plus packages. To avoid this, you have to move to the Business Host packages which offer everything a website owner can ask for. Wondering how IPAX stacks up against other Web Hosting companies? Enter any other Web Hosting company and we will give you a side-by-side comparison.